As a wedding photojournalist, I'm always searching for the decisive moment. Henri Cartier-Bresson was a French photographer who is also considered to be the father of photojournalism. He coined the term the decisive moment which to him meant the simultaneous recognition, and a fraction of a second, the significance of an event as well as a precise organizational forms that give that event its proper expression. In other words, in layman's terms, it's the most important moment within a moment. For me, it means that taking a photograph a split-second sooner or a split second later will yield an imperfect photograph. When it comes to popping the cork of a champagne bottle, I don't think I can time things any better than what you see in this photograph. The bridesmaids were all very ready to drink some champagne at the Annandale Golf Club in Pasadena, and it was my job to tell that story. 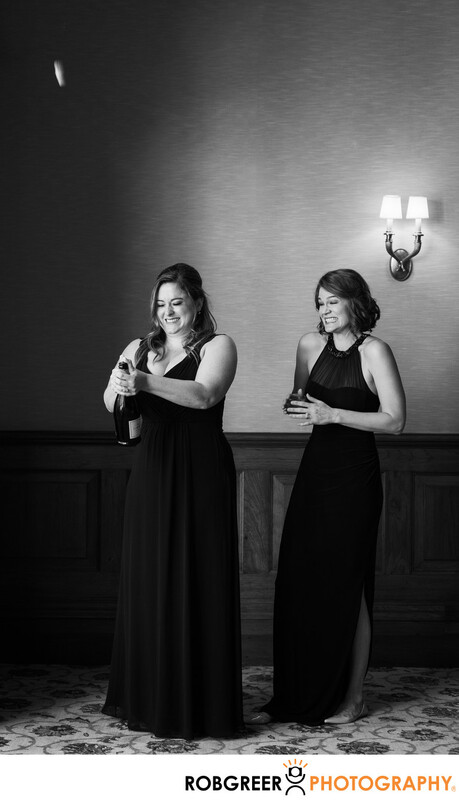 In this example, two bridesmaids, who we should call "the keepers of the cork," grabbed the bottle off the sideboard and proceeded to show us all the right way to open a corked bottle of champagne. I just feel lucky that the bridesmaid did not aim the bottle at me. Whenever I'm photographing a wedding in Los Angeles, champagne is often involved and whenever possible I'll always try to capture photograph of the popping of the cork or at the very least the flowing champagne that follows. Annandale Golf Club is located in Pasadena, California. 1/200; f/4.5; ISO 1000; 70.0 mm.